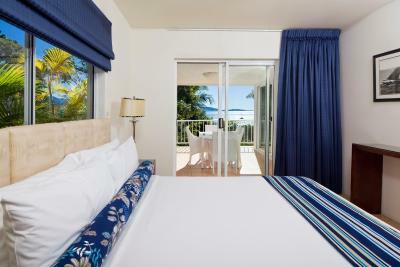 Lock in a great price for Coral Sea Resort – rated 8.9 by recent guests! The restaurant is fantastic. Great staff, ambiance and that view🤗 However, the breakfast lacks imagination and could do with a face lift....of course one can pay for an alternative but it shouldn’t be necessary. Avocado, boiled eggs and tomatoes that aren’t tasteless should not be that difficult or expensive to provide within the price. Lunch and dinner were both excellent however. The room and view were fantastic as well as the pool also owning to the view. The location is perfect for getting around with multiple bars and restaurants only a 5 minute walk in either direction. Location was amazing and beautiful right on the water, it is right by the main strip and the water park and marina, the outdoor lap pool was nice as well! Reception is very friendly, provide lot of useful local information and help keep tracking on the weather. We were upgraded to the penthouse suite and it was absolutely stunning! The rooms were very clean and comfortable and the bed is better than my own at home! There is a working hot-tub on the balcony and plenty of amenities if you want to cook at home. It is the type of room you could easily retire to! We also had some bird friends visit us and it was very picturesque given the view too. The view from our wrap-around veranda is arguably the best in Airlie! Coral Sea Resort This rating is a reflection of how the property compares to the industry standard when it comes to price, facilities and services available. It's based on a self-evaluation by the property. Use this rating to help choose your stay! 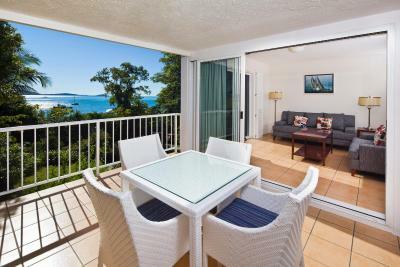 This deluxe 4-story award-winning resort is located on Paradise Point in the exclusive seaside enclave of Airlie Beach. An oasis of luxury and tranquility, this resort offers free continental breakfast, a restaurant, a bar and 2 swimming pools. Free WiFi is provided. Guests can relax in the lush gardens or work out in the fitness center. The property also features a private jetty and salon and massage facilities. All accommodations features a flat-screen TV with cable channels and free in-house movies. Most feature a private balcony. The tour desk can book Whitsunday and Great Barrier Reef day tours. Staff are able to converse in English and Chinese and transportation serviced in Chinese are also available. Your tropical continental breakfast includes cereals, croissants, yogurt, cold meats and fresh fruits. Cooked breakfast options are also available. A short stroll away via seaside boardwalk is the Abel Point Marina and the enchanting Airlie Beach town center with a variety of shops, restaurants and entertainment venues. When would you like to stay at Coral Sea Resort? This oceanfront suite features an indoor spa tub, wooden blinds, a private balcony and ocean views. This oceanfront suite features an outdoor hot tub and hammock, a private balcony and ocean views. Please note that the price is based on 2 guests. Maximum occupancy is 3, including a maximum of 2 adults (see Hotel Policies). A roll-away bed is included in the 3rd person rate. This air-conditioned room features garden views, a flat-screen TV, minibar and tea/coffee-making facilities. Twin bedding (2 queen beds) are available upon request only and subject to availability. 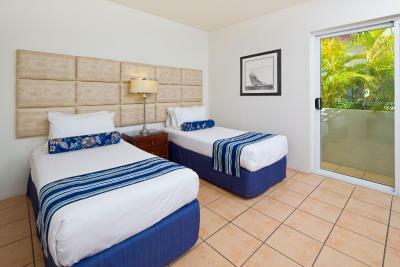 This air-conditioned room features a large private balcony with ocean views. It also has a flat-screen TV, minibar and tea/coffee-making facilities. This spacious self-contained apartment features two separate bedrooms, a full kitchen and a balcony. It also has a flat-screen TV. House Rules Coral Sea Resort takes special requests – add in the next step! Coral Sea Resort accepts these cards and reserves the right to temporarily hold an amount prior to arrival. Please note that a 1.5% charge applies for payments with Visa and MasterCard credit cards. Please note there is a 2.0% charge for payments with an American Express or Diners Club credit card. The resort is very dated, the breakfast that was included in our stay was minimal and pretty average. The pressure from the taps was a bit full on and hard to get right for temperature, the light flashing on the smoke detector woke me through the night. A screen door to the balcony would have been great for the mozzies. The location was fantastic. The view and the little jetty are really something! Beautiful grounds. Front desk staff are relaxed and friendly. Nothing really. It would have been nice if Mr Sunshine made an appearance but that can’t be helped. We loved everything. The staff were so helpful, friendly and approachable. The ocean view from our room was amazing. The kids had a great time. We’ll definitely be back again. Gorgeous views, easily the best hotel in Airlie. Hotel food was amazing, staff couldn’t have done more for us. 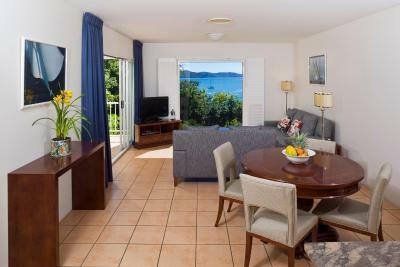 Perfect location for trips further out to whitsundays/great barrier reef. We loved that the hotel as an easy walk to the marina where we had just finished a bareboat charter holiday. The hotel has a beautiful, relaxing outlook over the pool and serves delicious, flakey croissants as part of the continental breakfast. We loved our overnight stay which was the perfect end to a great holiday. I would stay again. I've stayed here about 60 times over the years. Its gradually slipping. Little things. My stay of four days had to be cut to three before I arrived. Prepaid so no refund. That was my last visit! Much too expensive for type of property. Old, rooms not updated. Fan in bathroom didn’t work. Waitress at breakfast didn’t come and take our order after we had already asked her to. We had an issue on the second day. We came back from a day trip in the evening. Housekeeping made up our room and beds. But housekeeping did not change the dirty sheets and used the same dirty urine stained sheet to make up the bed. Spoke to Wayne at reception who attended to the matter personally and changed the dirty sheets with a clean one because housekeeping had gone for the day. On our last night I ordered takeaway dessert from the dinner menu. The lady who served me at the restaurant was the restaurant manager, I found her demeanor abrupt and rude (Maybe she was having a tough night). I ordered an Orange Chocolate Fondant with Raspberry sorbet, hmmm this was so yummy and highly recommended. The hotel has the best view in Airlie Beach in my opinion. The location of the hotel is Central to shops, Airlie lagoon and restaurants which is 5-10 mins walk. I would like to give a special thank to Wayne at reception. He was very accommodating and attended to all our needs during our stay. Our first night our daughter and son had trouble sleeping because of the loud music coming from the wedding reception, dont get me wrong this was fine with us we actually enjoyed the music and the kids enjoyed it too much that they did not want to sleep. I asked Wayne at reception at 10pm if he can find me some Crayons for my kids to be entertained until the wedding finished or until it quiets down. Wayne went out of his way to find me Crayons and made it happen. Thank you Wayne! Thank you to the ladies serving breakfast at the restaurant in the morning. The team of ladies were always very friendly, welcoming and hospitable, we enjoyed their friendly smile every morning. The continental breakfast had a good variety as well. The restaurant manager on Friday evening -5th April could have been more welcoming/friendly. Maybe she was just having a bad day. The other staff members were however very friendly and helpful. The hotel was a comfortable walking distance to the centre. Priceless views of the pool and the sea from the restaurant. Very good wifi. The jacuzzi in the room was amazing. - Great Dinner À la carte (Strongly recommend the market fish due to its vast ingredients that make up a memorizing experience) - Location - Want to point out the great service delivered by the front officer Wayne. We weren’t told about the free wifi. The chef at the restaurant went out of his way to prepare a delicious meal, not on the menu, for us. Fantastic. The location and staff were excellent. Booking process (once past booking.com) and reception staff not terribly friendly or welcoming. Toilet doors in room extremely flimsy - might as well not have one.